The story is adapted from a Hans Christian Andersen fairy tale. The Emperor’s Nightingale takes place in China in 1723 during the Qing (pronounced like ‘Ching’) Dynasty. At this time, China was a large and powerful empire covering over 8 million square miles and made up of 300 million people. The Emperor lived in a palace that was called The Forbidden City because only his family and government officials were allowed inside. The sweet song of a Nightingale saves an Empire. This brand new adaptation set in eighteenth century China, brings to light the younger days of Emperor Qianlong and his brother as they compete to determine who would become one of the greatest rulers of the Middle Kingdom. It takes a magical bird to help the headstrong and aimless Prince to become a King. Michael Bobbitt, who is the Producing Artistic Director of Adventure Theater MTC mentioned after the show that he spent three years getting this show to the stage, which apparently is typical for a new production. I’m sure that all his productions are labors of love, but I can’t help but think this production may have a special place in his heart because he is a parent of a child (now teenager) adopted from Vietnam. Until I really sat down to think about this, I didn’t realize how different this play is from other Asian entertainment I have seen. Except for the Asian performances I book for my son’s school, most of the Asian performances I have seen are done by amateurs at free Asian events; Lion Dances done by the Chinese Youth Club or other group, Chinese or Vietnamese dancers done by community groups. There are other professional performers which I have heard parents proclaim how wonderful they are, including the Japanese Taiko Drumming performances that tour or the Chinese Dancers/ Acrobats in the Shen-Yun Performing Arts which performs every year at the Kennedy Center. I’m not sure my eight year old would appreciate an evening of Japanese drumming (he would proclaim it too loud) or Chinese dancing (he only likes Michael Jackson). 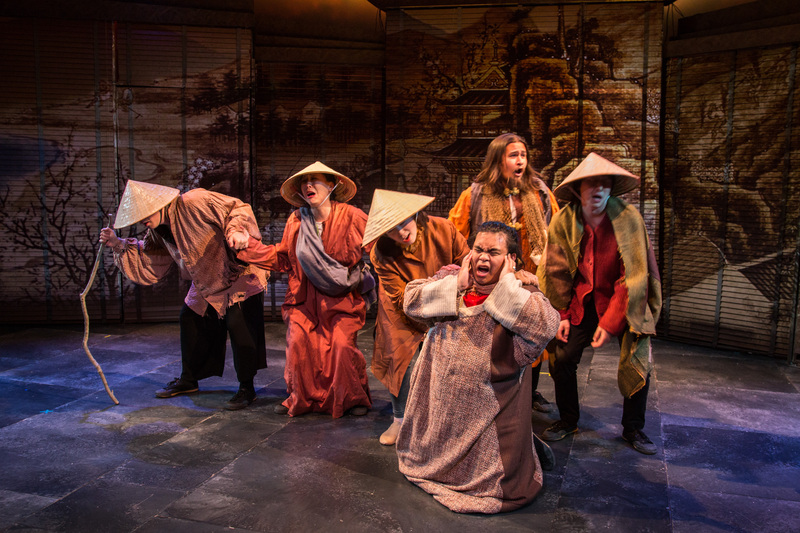 But here was an opportunity for a child who is not involved in music, theater or dance to enjoy a professional play about Asian characters, performed by Asian actors, with the production team being mostly Asian, including the director and playwright. For my child, the most important features of a show are 1) Is it entertaining? and 2) is it funny? We all enjoyed the show. I asked my son what his favorite parts were and he liked the two panda’s (played by Mikey Cafarelli and Sue Jin Song) who gossip about what is going on in the territory. I’m sure there were other things he loved about the show, but when it comes to funny, he loved the pandas. I liked that the play touched on several quintessential parts of Chinese culture, that a non-Chinese person like myself could recognize. 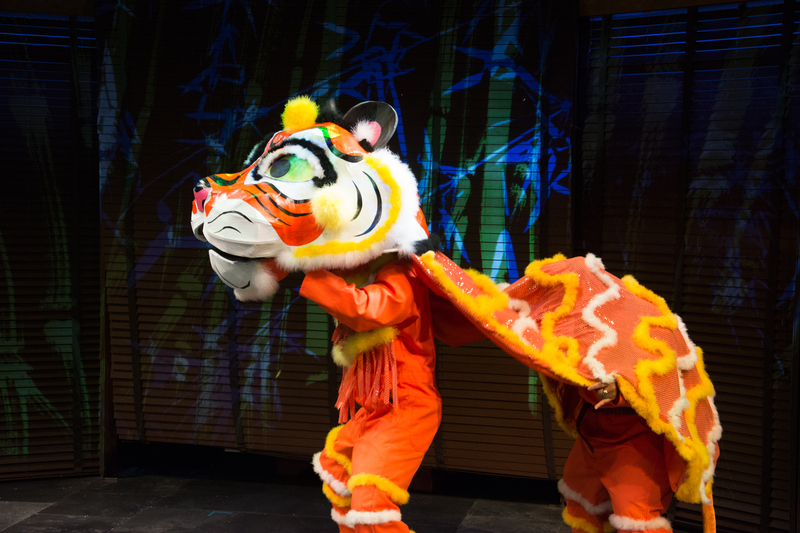 The tiger, which plays a pretty big role in the show is done as a Lion Dance. But what makes it really funny and fantastic is the Tiger tail separates from the head and talks to itself. This was an excellent way of moving the story along, but is also really funny. I loved both the costume and the comedy of the the tail (Andrew Quilpa). 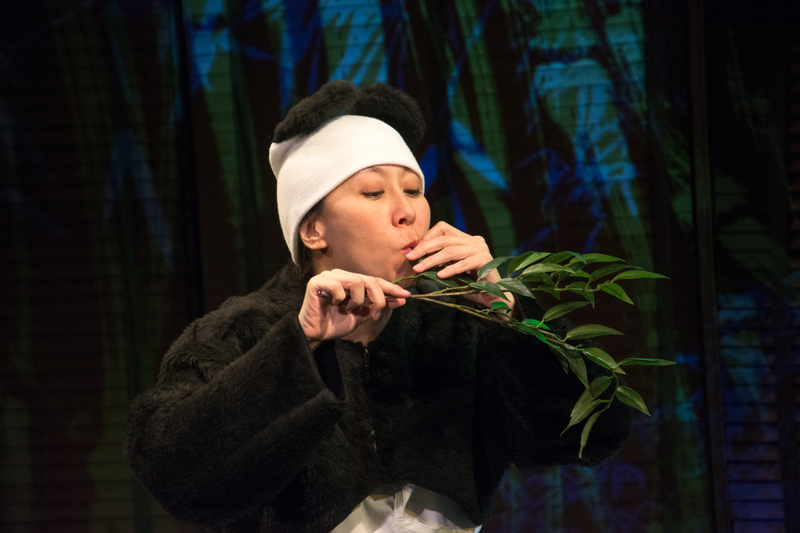 The Empress Consort (played by Sue Jin Song) fights against the tiger at one point and she brings out her “claws” like an Asian Tiger Mom (of course the kids didn’t get this). And the show has those two pandas that gossip with one another. At one point in the show they projected what looked like Chinese Shadow Puppets on to the backdrop. I’m not sure everyone would recognize the significance of this, but I had seen the shadow puppets at a Montgomery County Library when the Li Ming Chinese Academy did a bunch of different folk performances during a Lunar New Year presentation. Besides the humor of the Tiger tail, I loved the performance of Prince Bao (played by Brett Messiora). Prince Bao is the hero of the story and at one point he does a dance with a sword and you can see his dance background in this performance. And isn’t sword work another quintessential Asian thing? This is a touchy subject I know, I don’t actually know the ethnicities of the actors, but I can guess. Last names can often tell a lot about ethnicity and my guess is that there are a number of different Asian ethnicities that are represented in this production (I’m guessing: Chinese, Japanese, Korean and Philippine.) And just as important, there are a couple actors (at least) who appear bi-racial which reflect our society as a whole in 2016. Since the press release mentions an all Asian cast and production staff, I feel that I can bring up that it was also a diverse group of East Asians and Southeast Asians. I’m really happy that it is an all Asian cast, as too often white people are cast to play Asians. I loved the story, which being a children’s story, has a moral. The Nightingale (played by Nadine Rousseau) has a most beautiful voice. And it is always fun for the audience to have a couple “villains” in the show, Prince Hongshi (Andrew Quilpa) and Minister Wu (Jonathan Frye). The choreographer, Stella Choi, is the choreographer and instructor of the Fairfax Chinese Dance Troupe. Adventure Theater Musical Theater Center in Glen Echo is an intimate theater. The seating is general; so get there early to get the best seats. The seats are about as comfortable as the seats at McDonalds, but the show is only an hour. It is not “The Ring of the Nibelung”, although the person sitting next to me brought a seat pad. 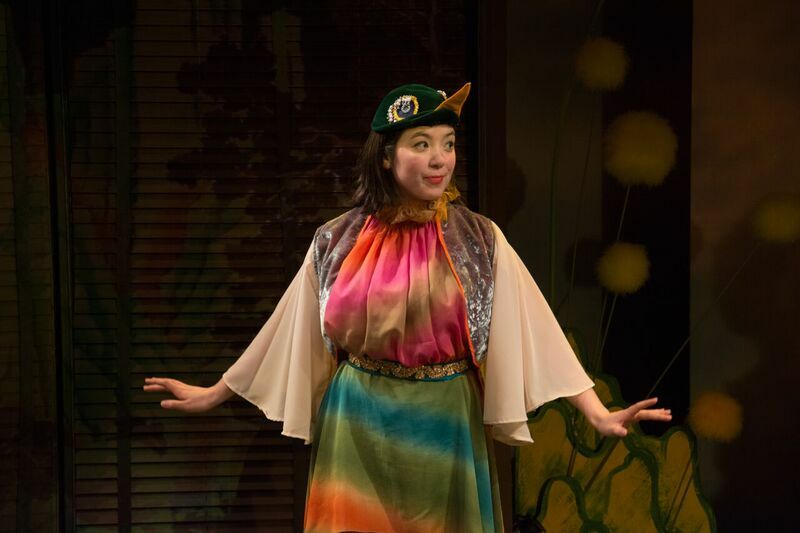 This is a chance for adoptive parents to let our children see Asian faces up on stage in a production made for children. I think the whole family will really enjoy it. The last time our whole family saw an Asian production made for children was Anime Momotaro at Imagination Stage in 2013. That is a long time ago. 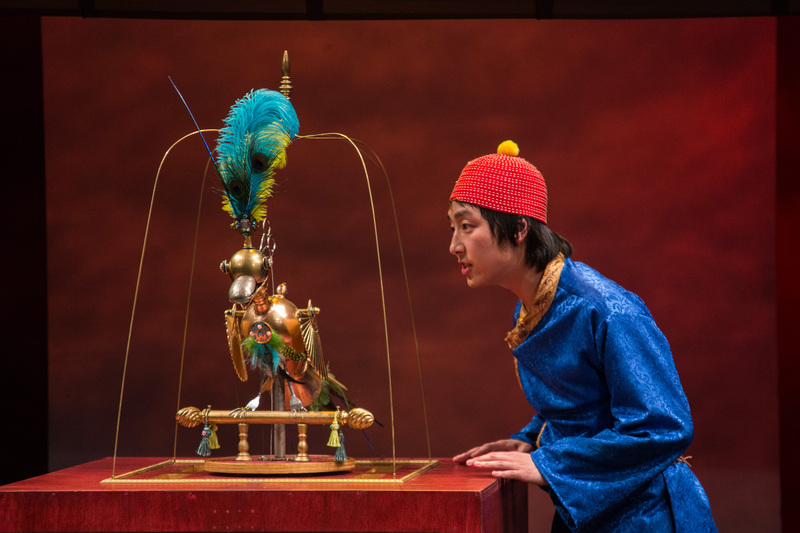 This entry was posted in Asian culture, folktale and tagged Adventure Theater, Asian American, Asian culture, Asian Pacific Heritage Month, The Emperor's Nightingale. Bookmark the permalink.